Adventure Aquarium offers a unique happy hour experience. UPDATE on Oct. 23: The event has been postponed. More details to follow. Those who purchased a ticket will receive a refund. Contact (856) 365-3300 x7543 with any questions. 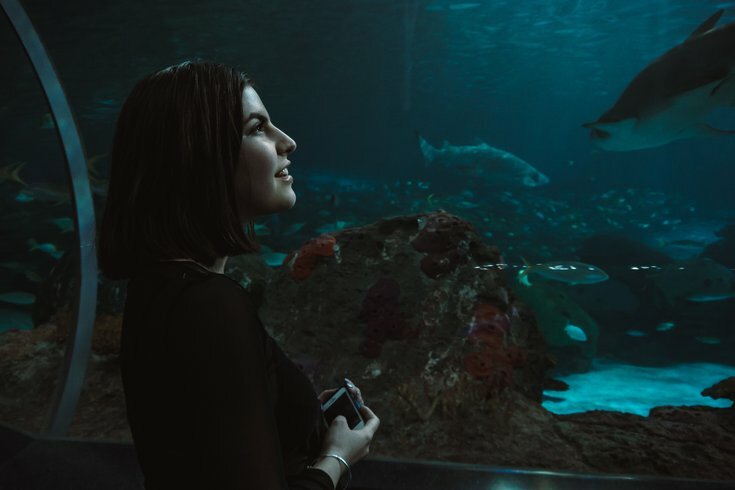 A few months ago, Adventure Aquarium in Camden, New Jersey, launched Sips Undersea, a unique happy hour series at the waterfront attraction. The next one will take place a week before Halloween, on Wednesday, Oct. 24. To celebrate the holiday, all attendees are invited to dress in costume. Maybe go as something aquatic? Or you could dress as Gritty when he visited the aquarium and was triggered by the sharks. Tickets to attend the after-hours event are $20 online and $25 at the door. Included is your first drink. The happy hour will run from 6 to 9 p.m.